What I Mean by "Epic"
We sling around the word “epic” a little too freely, thinks I. And I guess that I’m more prone so say something like that after the last few days. They’ve been – well – epic. When last I posted, I was at the hotel on Whiteman AFB in Missouri. After shutting down and clearing out, Rod Rakic and I headed out onto the base. The first order of business was to secure breakfast. It turns out that, as the Alamo and Riverwalk are to San Antonio, the breakfast burritos at the bowling alley are to Whiteman AFB. No fewer than three people volunteered that the breakfast burritos at the bowling alley were second to none and suggested that we’d be fools not to try them out. And they were right! Rod then dragged me to Military Clothing Sales to right a wrong that he has been seeing in my Air Force cover for months. I procured the largest one they offered (7-7/8) and it’s still a little small, but serviceable. Then on to the good stuff. We were guests in the tower to see how operations work at the base for the B-2 Spirit stealth bomber. Everything you’d expect to see in a regular FAA tower, but about twice the personnel and A-10s, T-38s, and attack helicopters also launching regularly. And, when it came time to launch the B-2 training sorties, let’s just say that we had a unique view from close up. OPSEC suggests that I say little more, but it was a completely new experience for me. Side note: Please pardon the lack of pictures or other multimedia. I left the cameras and other shovels and rakes and implements of the podcaster’s craft back in the car. OPSEC is king there at Whiteman and I wanted to be a good guest. I know that I’m the guy in the new-media community who’s the first to shout at another new-media guy, “If you didn’t get audio and video, it didn’t happen!” Fair enough. The following didn’t happen. The facility is in a vault (!) in the interior of the building with all kinds of security surrounding it. And that’s the security that we could see. I’m guessing that there were lavers upon layers of it that we couldn’t even tell were there. I’ve never been in a sim facility before that was this sophisticated or realistic. You walk over a bridge to the sim compartment, which is itself on hydraulic supports and capable of a wide range of motion in all relevant directions and at all relevant rates. It’s a full B-2 cockpit with a wrap-around video display that cover the entire window area. Each sortie involved a takeoff, a 30-degree turn (uncharacteristic for this aircraft that likes to stay very flat and present a very limited radar signature), a climb to a KC-135R tanker, various attempts at aerial refueling, then an ILS and landing back at Whiteman. Rod flew the first sortie and I flew the second. The guy not flying hung out in the control room with the sim technician and watched a set of panels and a view “outside” while listening to the conversation in the cockpit. Each sortie was about 0.7 long with the IP in the left seat and Rod or me in the right seat. You have a stick in your right hand and a fistful of throttles in your left hand. The PTT for the intercom is on the throttles. There are varying levels of automation and you engage them at various points after takeoff to assist in flying the aircraft. Takeoff was surprisingly normal-feeling. Just a lot bigger and more protracted. Not unlike flying the DC-3 or another large aircraft that actually has vertical control surfaces to speak of. There’s a long takeoff roll and then you rotate off at well in excess of the cruising speed of most of the aircraft that I usually fly. Once established, you let the autopilot fly the climb airspeed until it’s time to pitch over for cruise. At that point, the sim causes a KC-135R to appear magically in front of you and you climb to meet it. Boy, do I have a lot of respect for anyone who gets gas in mid-flight! 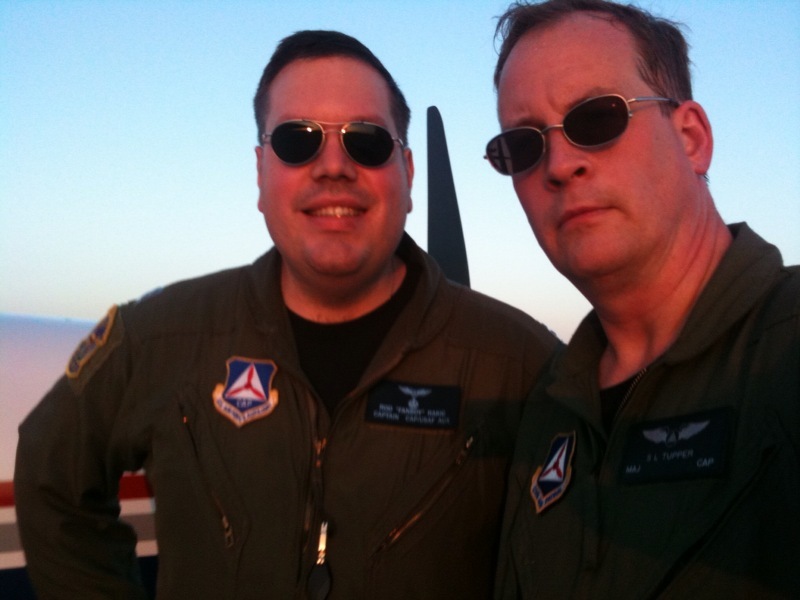 I suppose I had already begun to have that respect from the sortie last summer in the KC-135R from Grissom ARB. But the process from the “get” side is awe-inspiring. I was really saturated throughout the refueling process. But I remember stealing glances at the airspeed indicator and kicking myself for being two knots off. Two knots makes a big difference. It’s a walking pace. You can cover a lot of linear distance in ten seconds at two knots. Enough to blow right out of the top, bottom, or sides of the 2,000 or so cubic feet that I’m guessing make up the volume in which you can receive gas. And the B-2, like any other large aircraft, reacts slowly and deliberately to control inputs. If you’re moving the controls in response to what you see out the window right now, you’re just piling up pilot-induced oscillations. What you see out the window and on the displays is the aircraft reacting to what you did three to seven seconds ago. It’s like playing guitar plugged into a long delay effect. You’re listening to what you did awhile ago, but you have to play now to make stuff happen in a few seconds or the whole thing gets downright un-musical in a hurry. Rod and I each had boom strikes on the windshield and we caused permanent simulated psychological damage to the simulated boom operator. Neither of us actually got connected to the tanker. But neither of us killed anyone, either. Each of us confided to the other after the experience that he was hoping like hell that the other guy wouldn’t get any gas. KMHL to KPWK is a long time to spend in a C-182T with a guy who got gas when you didn’t. Rod got the better landing. You don’t flare the B-2. It’s a flying wing. You just point it at the touchdown zone and roll the power to idle. The airplane flares itself. I had a hard time with that and had to push a little at the IP’s call. Rod just flew the thing on. Cool on his part, but not enough to make the flight back to Chicagoland in said C-182T any worse than it needed to be. 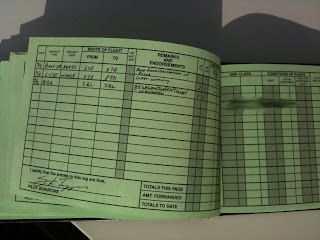 And I guess I got the last word by remembering to bring my logbook. 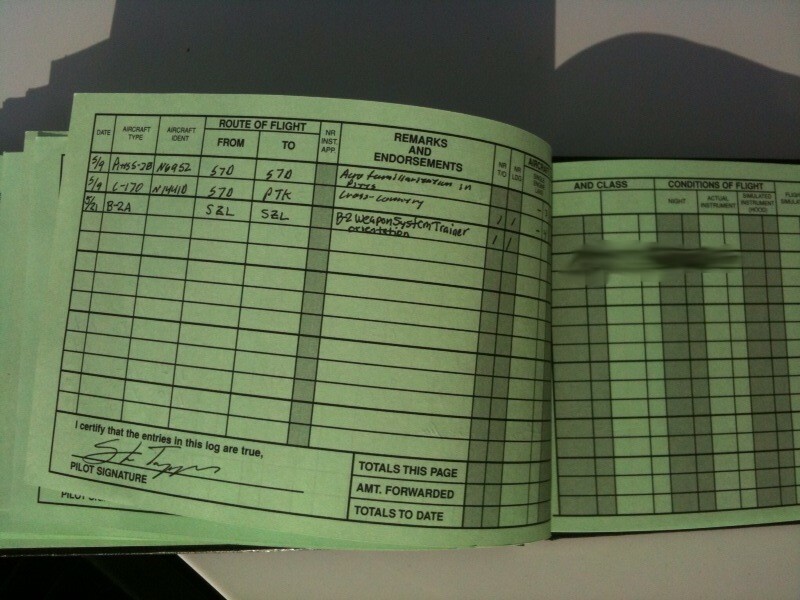 The IP signed it for the sortie and an already cool logbook got one notch cooler. We got back into the minivan and headed back to Marshall (KMHL) to preflight, fuel up, and get back to Chicagoland. We launched just before sunset and air-filed back to Chicago Executive (KPWK). It was severe clear most of the way back with stars guiding the way, but the destination was iffy. A low-pressure system was dominating the whole area. KPWK was forecast to be 1,000 overcast with four miles or so of visibility and we were good to go with that. Two G1000-qualified aircrew in a good airplane with lots of alternate options. As we neared the area, the METAR had dropped to 300 overcast with low visibility in mist. We were busting through banks of stratus and cumulus clouds, although the ride was mostly smooth. We got within 10 miles or so of the airport, snatching glances down through breaks in the clag to see the whole area around KPWK socked in. We had briefed minima for our aircrew of 1,000 ft ceilings and three miles of visibility. There was some temptation to go down for a peek, but I’m proud to say that this aircrew planned the flight and flew the plan. Rod keyed up ATC and requested a diversion to DuPage (KDPA). We got vectors immediately and planned for the ILS. The approach got downright interesting. We spotted the runway from two miles outside the final approach fix. About that time, KDPA tower advised us that visibility was at a half mile – minimums for this approach. We let the tower know that we could plainly see the runway. The tower allowed as how the other end of the airfield might be worse than our end of the airfield. In any case, we had both FAA minima (according to the AWOS) and out own minima (according to two installations of the Mark II Eyeball) and Rod brought her in for a good landing. As it turns out, the other end of the field was socked in pretty well. I recall offering Rod $100 cash if he’d shut off the strobes sooner rather than later. But we made the taxi to Illinois Wing CAP headquarters without incident and buttoned up the aircraft for the night. The next day was a training exercise for the Illinois Wing. As many of you know, I’m planning to attend Civil Air Patrol Mission Aircrew School at the National Emergency Services Academy next month and get trained to be a mission pilot. In order to do that, I need to first, among other things, become a mission scanner. I had completed all of the requirements other than a couple of technical operational items and flying on two training sorties. I’ve been slightly bunched up about the possibility of not getting the sorties in and missing the chance to go to MAS, So I lined up three opportunities in the hopes of hitting two. The first was an Illinois Wing exercise on Saturday. Rod had arranged to let me fly on an aircrew in the exercise to known out a sortie there before driving home. The next opportunity was a Michigan Wing SAREX at KFNT the next day and, if one of those opportunities blew out, I had a self-funded unit sortie scheduled for Tuesday. I got the Saturday sortie after the weather cleared up at KDPA. 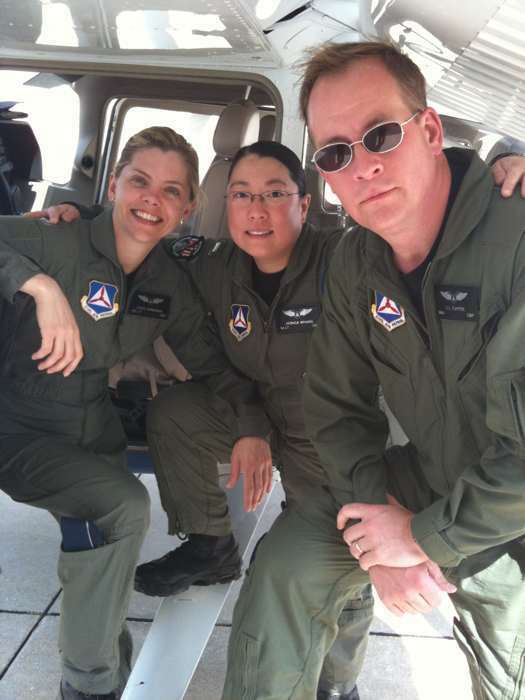 I sat front seat with Rod and we had the privilege of flying with 1Lt Tommy Whang and 1Lt Sheri Sorenson in the back. Sheri was flying a scanner sortie and the Tonny was shooting photos to maintain a qualification. We located the target northwest of the Chicago area, did an expanding square pattern with the help of the G1000 and the GFC 700 autopilot before getting the required pictures and heading home. I beat feet for home and arrived at KFNT early the next morning. After cooling my heels at the mission base for a few hours, Capt Norm Malek and 2Lt Dave wood arrived with the KPTK C-182T. We drew a sector search with a start at a lat-long point and a full mow of the lawn for the rest of the sector if we didn’t find anything. And there was a photo mission to boot on the way back. 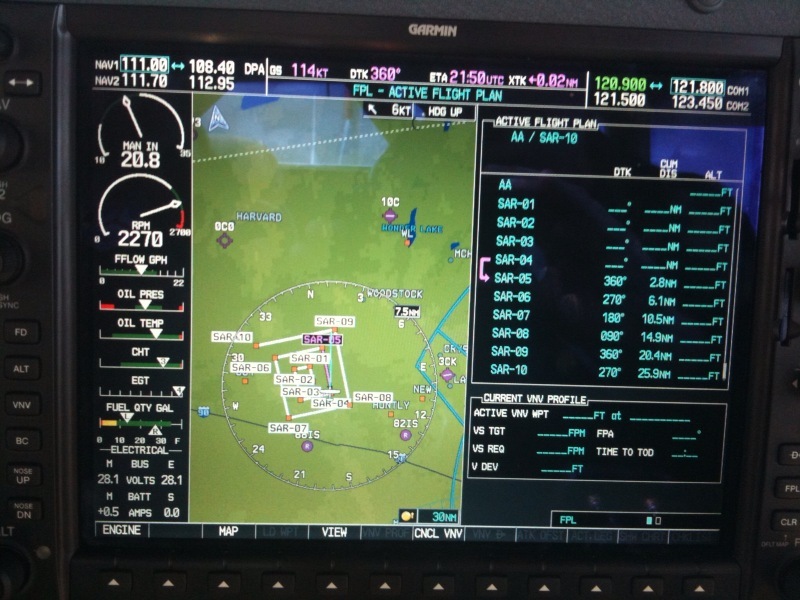 We arrived at the start point and I set up the search with the G1000. 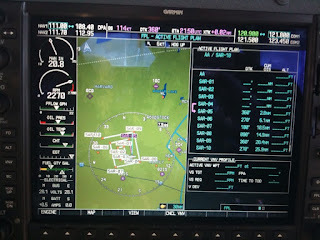 The amount of time that I have in this particular airplane, together with the seven or more hours I’d spent sitting behind the G1000 over the prior few days, made setting up the search second nature and I had us in an expanding square in no time. 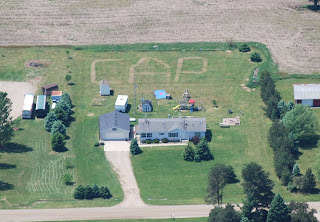 By the fourth leg of the square, Dave spotted a blue tarp and the letters “CAP” mowed into the grass behind a house in the search area. We radioed in to base and were instructed to photograph the find and then return to base. Mission scanner sortie no. 2 complete! Locked and loaded for MAS and NESA 2010! And the end of an exhausting and challenging four days in a flight suit. Which brings me back to the epic-ness of the last few days. We spend amazing amounts of time, money, and energy learning how to fly. How to make airplanes perform missions to their full potential. And, all too often, it’s simulated ersatz stuff. Hoods instead of clouds. Discussions of hypothetical weather on hypothetical trips to hypothetical places. Calculating weight and balance for people in the back seat who never actually sit there. I’m not saying that those exercises aren’t useful. They are. But it’s not hard to arrive at a state of mind in which the hypothetical is enough. Is all you need. Is normal. I’m here to tell you that it’s not enough and you shouldn’t let it be normal. It’s not easy to decide to launch into known weather on one of the longest trips you’ve ever flown. In strange airspace. To strange airports. With the very real challenge of thinking on your feet when things don’t go as planned. Then doing it at night in sustained actual IMC with low ceilings and wildly varying visibility. Then launching with a CAP aircrew to go find stuff on the ground that, although simulated, is real enough for you because you’re up there packing crazy amounts of workload into limited bandwidth and actually putting the words of the MART into action and objectively demonstrating skills. None of this stuff is easy. Especially the first time. And the general aviation training culture seems pretty willing to let you keep pretending as long as you like. But I’m here to tell you that the hard stuff is worth it. I just got a four-day immersive demonstration of that very thing. I stretched just about every limit I had and the preparation and willingness to go launch into it paid off. This is epiphany. This is discovery.